Valkyrie is officially joining the fight in Avengers: Endgame. There were some notable absences in Infinity War last year. Much of that probably had to do with the fact that there were already so many characters thrown in the mix and directors Joe and Anthony Russo had to handle a very delicate balancing act in order to make it all work. One of the most curious absences was Tessa Thompson's Valkyrie, who we were introduced to in Thor: Ragnarok. Now, we finally have confirmation that she not only survived, but she'll be along for the ride next month. Marvel decided to reveal a series of 32 different character posters today in honor of being one month out from the release of Avengers: Endgame. 16 of the posters were done in black and white to honor fallen heroes, while 16 were done in color to represent those who are left to do the avenging. One very pleasant surprise came in the form of a character poster for Valkyrie, which was in color and seems to confirm not only her survival, but that she'll be joining the fight alongside the other remaining Avengers to try and rebalance the universe after Thanos wiped out half of it. When last we saw Valkyrie, she was on board the Asgardian refugee ship with Thor and the rest of his people following Asgard's destruction. They were seeking refuge elsewhere and had plotted a course to Earth. Unfortunately, their ship was intercepted by Thanos and the Black Order. The beginning of Infinity War showcases the wreckage of the ship, with seemingly everyone on board dead. But we never see Valkyrie, which left questions not only about her fate, but where she ended up. It remains to be seen how Valkyrie avoided death at the hands of the Black Order like everyone else. Either way, she's alive. And frankly, The Avengers can use all of the help they can get at this point. Even with the addition of Brie Larson's Captain Marvel, who is extremely powerful, the odds are still stacked against our heroes at this point. Speaking of Captain Marvel, the internet, as of late, has been fond of the idea of Valkyrie pairing up with her, so to speak. It was previously revealed that Valkyrie is bisexual and there was a scene cut from Thor: Ragnarok that would have showcased that. In any event, it's now at least somewhat possible this could be explored. Tessa Thompson, for her part, signed off on the idea on Twitter, responding to some fan art by saying, "we so cute." It's doubtful that there will be any time for new relationships in this movie, so that will probably have to wait until a later date. Either way, at least one of our many questions has been answered. But where are Korg and Miek? Avengers: Endgame is set to hit theaters on April 26. 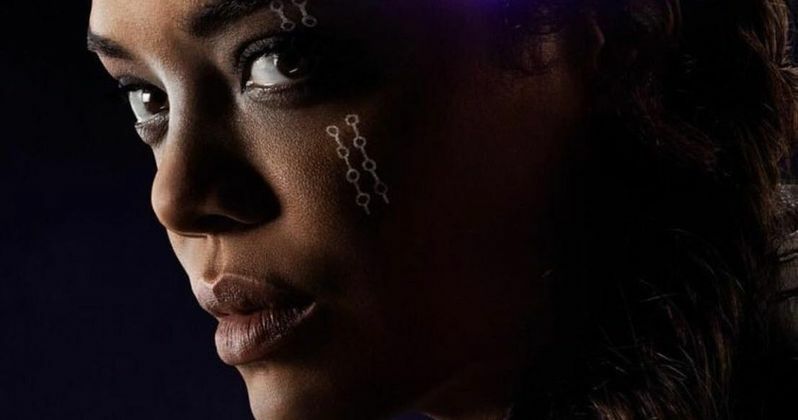 Be sure to check out the poster from Tessa Thompson's Instagram below.